RONNY Deila grew up in Norway as a self-confessed Liverpool fan and has retained an affection for the Anfield club throughout his adult life. 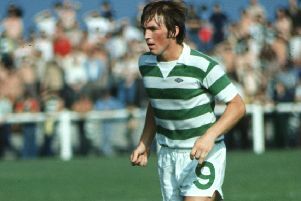 But the Celtic manager is less than enamoured by the reaction of one of his favourite former Liverpool players to the Scottish champions’ pulsating and dramatic 3-3 draw against Inter Milan in the Europa League on Thursday night. Steve McManaman was on punditry duty for BT Sport’s live television coverage of the first leg of the last 32 showdown at Celtic Park and was left unimpressed by both the performance of Deila’s team and their post-match reaction to the result. Deila led his players in acclaiming the Celtic supporters after the final whistle of a breathless contest in which John Guidetti’s stoppage-time goal earned parity and retained a foothold in the tie ahead of next week’s return leg at the San Siro. McManaman felt the celebrations were inappropriate on an evening when he believed Celtic had missed an opportunity to defeat an Inter side currently struggling in mid-table in Serie A. But Deila, who has developed a habit of demonstratively engaging with the Celtic fans after games, has branded McManaman as “stupid” and defended the manner in which his squad acknowledged the backing they received from a 60,000 sell-out crowd. “Steve McManaman was a great player and was one of my favourites when he was playing for Liverpool,” said Deila. “But for me, this was such a stupid thing for him to say. “One of Celtic’s values is respect. Sometimes, even when you don’t get the result you want, you have to thank your fans when they are as unbelievable as ours were on Thursday. I think the fans appreciate that as well. “They helped us so much in the game and I think it is important that the players and the coaching staff show we are grateful for what they did for us. “For example, even after Craig Gordon made the mistake which let Inter go 3-2 up just before half-time, the fans sang his name. In the second half, he made two or three good saves because that support lifted him again. There are not many stadiums where that would happen and that’s why you have to thank the fans at the end. Deila admitted to getting little sleep when he got home on Thursday night, with the adrenaline from such a tumultuous contest taking some time to subside. He reflected with mixed emotions on a 90 minutes which both showcased Celtic’s attacking potential but also exposed their defensive flaws. “It was a good night and it was almost a great night,” he said. “The performance was good in that we did a lot of the things I hoped for. But it is a little bit irritating that we gave away goals too easily, because that cost us hard. “It is tough when you are under pressure more in the European matches. But it also lets you see where you need to work on the defensive aspect. “In the domestic matches, we have 60 or 70 per cent of the ball and it is easier to defend. But we also made individual mistakes on Thursday night. “I wasn’t so surprised at the way the game went, because I had seen Inter play a couple of games. They played a diamond in midfield and we knew if we switched the play, we would get a lot of spaces. That’s what we did for both of our goals in the first half. We made other chances with switches and early crosses. “In the second half, Inter changed their system and were more compact. But we still managed to open them up. Twice we had one-on-ones with their ‘keeper and then we scored another goal. “I’m very satisfied that we could keep a team as good as Inter under pressure, push them back like we did and come back from 2-0 down. “But, shape-wise, we were too open in defence. We had too much distance between the central defenders There was always some gaps. Mauro Icardi was very good with his movements in getting behind us all the time. When you push up so high as we do, you have to be very, very alert in everything you do and follow the play and be aware of what you are doing. “If not, you are going to get punished quickly. This is a very difficult style of play, but it’s fun to play. It’s nice for the fans to watch but you need to be very, very switched on. If not, you get caught in the big spaces behind us. “We won’t change the way we play in Milan, but we have to adapt it. We just have to defend better than we did on Thursday. For our chances of getting through, clearly 0-0 would have been better than 3-3. But I like the way we entertained, I always want to do that. Celtic return to domestic business tomorrow with the visit of Hamilton Accies, an occasion where the atmosphere is likely to be in the sharpest possible contrast with the feverish experience of Thursday night. Deila is wary of his team falling flat and dropping any points in their push for the Premiership title. “You see it in a lot of European leagues where teams struggle on Sunday when they’ve played in the Europa League on the Thursday,” added Deila. Kris Commons will return to the Celtic squad tomorrow, the playmaker having missed the last three games because of a thigh injury. Winger James Forrest is also available again. Defender Mikael Lustig and midfielder Charlie Mulgrew continue to miss out through injury. Guidetti’s headling-grabbing contribution on Thursday night may also have earned the on-loan Manchester City striker a recall to Deila’s starting line-up against Hamilton. It was the Swede’s first goal since the end of November and his manager now expects him to embark upon another prolific run of form.